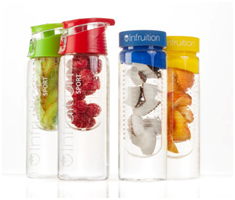 Infruition - 100% Natural Fruit Infusing Water Bottles. These new Fruit Infusing Water Bottles from Infruition are great fun and look pretty cool too. We're always being told to drink more water and drink less fizzy drinks full of unwanted sugars. My eldest daughter (12) was so excited when she came home from school last week to one of these bottles. She'd been asking for one for ages after seeing one of her teachers at school with one. They're really easy to use and leak proof making them perfect for school use. At the moment they only come in one size (700ml) which is adult sized but I have heard that a new children's sized range could be on the cards in the future which I think would be a great idea as the novelty of these bottles makes fruit appeal more interesting to little ones. Chloe, my eldest is happy using the adult sized bottle as she drinks quite a lot of water anyway but I'd love some smaller ones for my younger two. Our favourite summer fruit is Strawberries so we had to try out a strawberry Infruition first. 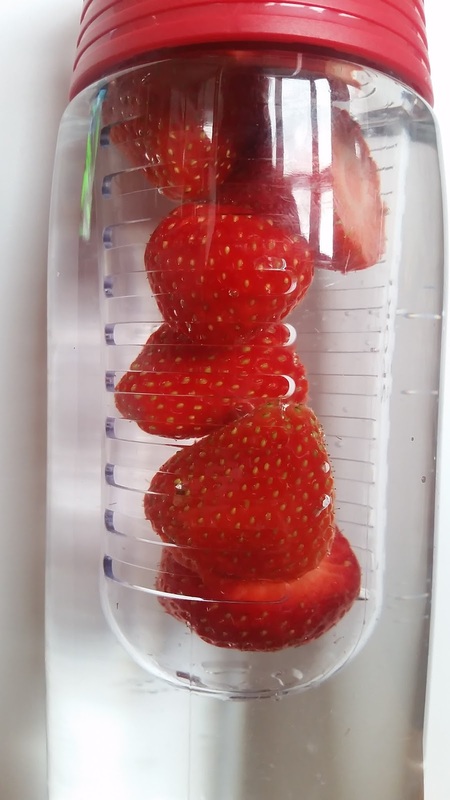 I love the way the strawberries are popped safely into the middle of the bottle but are mixed with the water that surrounds them as there's large slots in the tube that holds them. Your fruit stays separate at all times but their flavours are free to infuse with the water making for a really lovely yet natural flavoured drink and what's even better is that when your water is all gone, you can then open the bottle and eat the strawberries too. Chloe loved the fact that she got a refreshing drink as well as a nice handful of strawberries to eat on her lunch break too. As they're in a separate compartment, we found that they stayed in one piece but were lovely and cool from being in the water all day. We love our Infruition bottle here and will continue to use it, the possibilities of what you can put inside it are endless. I wonder what fruit infusion we will make next? These look fab, fruit infused waters are certainly popular right now! !